In the pattern tab, remember channel transpose amount also after closing the tab. When making an order list selection using the keyboard, do not update the play position. Changing the plugin of a PC event via the Note Properties didn't update the parameter list in that dialog. Pattern transitions were executed too early if a pattern loop ended on the last row of a pattern. Dragging a single pattern with "Follow Song" enabled could modify the dragged pattern selection on pattern transitions. Duplicating patterns did not apply the original pattern's tempo swing settings. Tempo swing settings were ignored when setting them to 100% for each row for a specific pattern, even if this differed from the global swing settings. Allow a maximum instrument fadeout value of 32767 in MPTM, like in XM. Add "Open in Explorer" to the instrument library directory context menu. Insert key can now be used to insert items in the tree view (e.g. samples and instruments), Shift-Insert to duplicate them. Fixed an excessive performance drop when modifying a sample or instrument in a module containing hundreds of samples or instruments. Converting an XM instrument with no volume envelope to IT / MPTM now creates an envelope which instantly cuts the sample on key-off. Tremolo on quiet notes was broken in OpenMPT 1.26.06.00. Pattern loops ending on the last row of a pattern were not executed properly in S3M files. Default 8-channel mode tempo in MED files should now be imported correctly. 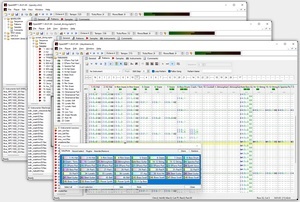 Patterns with identical contents but different time signatures were merged when choosing to remove duplicate patterns in the Song Cleanup. Hi, I normaly uses madtracker 2.6. I wanted to run and check this openMPT and open my madtracker modules but delay efect doesnt work. Is it possible to play mt2 modules in correct way? Do i have to change something or instal some plugins? Internal MT2 effects are currently not emulated, but they may very well be supported in the future. VST plugins in MT2 files are already supported.